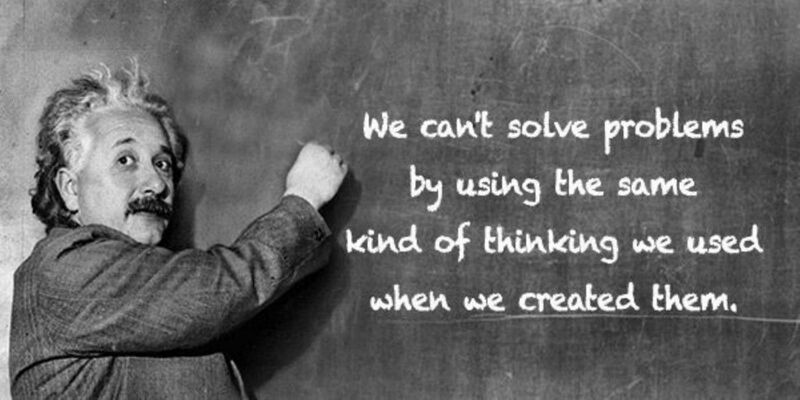 Einstein was certainly right — we can’t solve problems by using the same kind of thinking we used when we created them. In addition, with the rapid changes in society, the methods we have previously used to solve many of the problems we face are no longer effective. We need to develop new ways of thinking in order to design better solutions, services and experiences that solve our current problems. Design Thinking steps in with a bold newly systematised and non-linear human-centred approach. This will help us radically change how we go about exploring problems and creating solutions to those problems. Which Problems Can Design Thinking Help us Solve? One of the first questions people ask when hearing about Design Thinking is, "What is Design Thinking best used for?" Design Thinking is suited to addressing a wide range of challenges and is best used for bringing about innovation within the following contexts. Design Thinking is best suited to addressing problems where multiple spheres collide, at the intersection of business and society, logic and emotion, rational and creative, human needs and economic demands and between systems and individuals. We would most likely not require Design Thinking to tackle tame problems — that is, problems that are simple and that have fixed and known solutions — unless we were seeking a novel or innovative means to solving the problem with a different desired goal than the typical available solutions. However, Design thinking is not necessarily only to be understood as a process or method for solving a set-in-stone collection of problems. It is also a mindset that can be applied in almost any scenario where innovation or thinking differently is required. It can also be combined with other methodologies, business strategies, social innovation models, and management practices. It's something that changes depending on its context and can use tools and techniques from other disciplines. Design Thinking works best where we need to make human sense of things, approaching challenges in ways that best suit human needs regardless of the scale or authority of the challenge. A conformist, controlled, technical or linear approach is no longer able to grapple with the newly complex and sensitive needs of modern society. It starts with an intention, a desire, a need or yearning towards a better situation or state. We have no way of knowing whether this is a mere dream or a practical and viable path to take. Design Thinking gives us the tools to explore What Could Be. "It's not about the world of design, but the design of the world". Since the disruptions in human development caused by the Industrial Revolution, analysts have been strategizing ways of streamlining just about every business, production and economic process imaginable with the aim of extracting the maximum benefit from the least amount of time and resources. While this may have had some degree of success on the level of productivity and efficiency, the recipe to that much-needed innovation within all sectors has been somewhat of a conundrum. This is where Design Thinking steps in with a bold new human-centred approach at radically changing how we go about exploring problems and finding solutions to those problems, helping us break out of the old moulds we've become stuck in, so as to take a fresh look at the world around us. Besides the ongoing struggles between the analytical and creative worlds, other factors have dramatically disrupted the way we see, understand, experience, and interpret the world around us. Technology is developing at such a rapid pace that job descriptions can barely keep up, let alone entire industries. Consumers demand much more now that they are constantly switched on, always informed, and obsessively sharing everything with their networks. In order to remain relevant, companies and organisations are also fighting a battle for attention on an unprecedented level. Besides the constant scrutiny and accountability, information overload is also reaching its peak. People are increasingly seeking out those products, services, and organisations that they personally connect with on a meaningful level. Many people are selecting the few options that speak directly to their human needs and experiences. This has driven Human-Centred Design and Design Thinking approaches of all types to mushroom in the last few years. Approaches to business and social innovation are increasingly looking for alternatives to the old models of adding value, by focusing on human needs and experience as primary motivating factors. Innovative solutions need to be found that can keep up with massive disruptions affecting Human Resources, Energy, Sustainability, Education, Economic Constraints, Political Instability—these large, systemic and complex problems with capital letters—and a whole plethora of other challenges which existing strategic and management practices and processes are unable to pick apart. Idris Mootee, CEO of Idea Couture and a leading expert on applied Design Thinking in large-scale strategy innovation, wrote his book Design Thinking for Strategic Innovation about the implementation of Design Thinking methodology within business. The book outlines a number of disruptions in the business environment, including new consumer behaviour and expectations, forcing companies to rethink their every move. Idris Mootee uses the analogy of the study of weather systems, where it was determined that even the slightest changes in atmospheric conditions may have dramatically varying results in the way weather patterns developed. The current climate of rapid change and upheaval is even more difficult to forecast for the future. We are unable to see what lies around the next corner, let alone months or years down the line. This means we need a completely new and dynamic approach to innovation and strategic planning: something less rigid that can quickly and easily adapt to the varying conditions we find ourselves in and those dramatic changes which lie around the next corner. The abilities to understand and act on changes rapidly in our environments and changes in human behaviour are becoming crucial skills we are still developing and refining. Design Thinking offers a means for grappling with all this change in a more human-centric manner. In order to embrace Design Thinking and innovation, we need to ensure that we have the right mindsets, collaborative teams, and conducive environments. Creating the right mindsets, selecting the appropriate team, and setting up environments which encourage innovation to take place are three of the essential aspects of fostering successful innovation within companies, organisations, and society at large. One of the amazing things about Albert Einstein was the connection between his creative and analytical thinking. He was an extremely creative individual, deeply reflective of the human condition, weaknesses and failings while at the same time years ahead of most in terms of his analytical thinking capacity. His ability to join and synthesise worlds of influence, merging creative thinking with intense analytical abilities brought about the breakthroughs he achieved as a thinker and a scientist. Like Design Thinking, Albert Einstein relied on and celebrated both logic and imagination. The notion that creativity or "artistic" talent is only the domain of those gifted with these abilities is one of the most inhibiting factors in our lives today. However, it is becoming a more widely held belief that creativity and lateral thinking can be learnt, and with the implementation of the appropriate steps, process and mindset, can be unleashed to solve some of the "wickedest" problems (i.e., most complex and tricky problems) we find ourselves faced with. The challenge is that most modern corporations, organisations and institutional settings tend to kill creativity with an overly conformist notion of things. The struggle between creative and logical thinking is an old one, which is yet to be understood fully, even with scientific breakthroughs in neuro- and cognitive science. It has been a common belief that those who tend to be more analytical, logical and rational in nature have always relied more heavily on the left side of their brains, while those who are more creative, expressive and emotional have relied more on the right side. This myth seems to have recently been busted, with studies indicating both sides of the brain are involved in both creative and logical processes of all kinds and work. We need to develop more open, collaborative, and explorative cultures and mindsets, which combine both logic and imagination, in order to create new innovative solutions. And Design Thinking will help us do just that. It is the norm in many organisations to encourage the development of skills and abilities relevant to a specific role. For instance, creativity is encouraged in graphic designers, while analytical skills are encouraged for marketing, business, and operations-related jobs. However, such a “boxed” organisation of talent, where different skills are developed and used in silos throughout different departments, will not be able to produce much of the innovation we need for the new wave of wicked problems. We now know that a healthy collaboration between the creative and logical ways of thinking is crucial in creating the kind of holistic thinking that is required to understand and solve new kinds of multi-dimensional problems. This is also true for people working in multidisciplinary teams, where teams possessing a range of thinking styles, expertise, and experiences come together to develop solutions more effectively than narrow-focused, specialist individuals are able to working alone. In Design Thinking, cross-disciplinary collaboration plays an important role — it is when designers, ethnographers, business analysts, and marketers work together that we create truly revolutionary ideas. To facilitate Design Thinking and innovation, thus, organisations need to start thinking about truly cross-departmental, cross-disciplinary collaboration, and abandon the silo model of skills. The environments we inhabit and the activities we most engage in influence our thinking patterns, our understanding of things, and our ability (or lack thereof) to innovate. This is why innovative companies like Google spend money to create workspaces that are filled with toys and unconventional equipment, and areas for creative thinking throughout their offices. It’s also the reason that many companies clear space in their busy annual schedules to send their entire staff on team-building getaways where they build rafts together, jump around in circles and, in the best way possible, behave like kids. However, it’s not only to make the company a fun and interesting place to work. It's about allowing for and tapping into the type of thinking which results in breakthrough innovation as opposed to churning out more of the same cookie-cutter patches to problems. Playing is risky business. You put yourself out there. Likewise, it takes courage to question status quo and come up with innovative solutions. That’s why we need to create dynamic spaces, both physically and metaphorically, where people are able to embrace change, explore the unknown, experiment with radically new ways of thinking, and work together collaboratively. Google is one of the major companies which prioritise to spend time and money creating playful workspaces filled with toys and unconventional equipment. The goal is to help employees feel safe and that it’s okay to come up with new and unconventional solutions in a playful manner. How can you start forming the right mindsets, set up cross-disciplinary teams, and create playful environments to foster innovation? Let’s take an example. After the 2000 dot-com bubble burst, IDEO CEO Tim Brown decided that it was time to do a redesign of the organisation. In the redesign, IDEO transformed the way collaboration within the organisation, as well as with external partners, worked fundamentally. IDEO created the concept of “One IDEO”, which underscores the need to act not as independent design studios, but rather a single interconnected network of talents. The company also changed the way it organised its offices by abandoning the classic design studio model. Instead, they started adopting a “global practices” model, which helped teams organise according to global systems in areas like “Health Practice” and “Zero20” (which focuses on the needs of children up to the age of 20). New organisational structures like that in IDEO — which are themselves subject to change as and when needed to better serve the needs of clients and the world — are needed to spur innovative collaboration between teams and create impactful solutions that make the world a better place. However, the changes do not have to be large-scale. While it’s nice to have adult-sized playgrounds like those in Google and Facebook campuses, it is more than enough to ensure that the organisational layout and philosophy is one that encourages and prioritises collaboration and innovation. The challenges organisations and countries face today are much more complex and tricky than the ones we faced a few decades ago. Part of the reason is globalisation, which brought together different agents across the globe into an interconnected web of systems that affect one another. To solve these new, complex problems, Design Thinking steps in with a bold and newly systematised, non-linear human-centred approach. Design Thinking allows us to adopt a human-centred perspective in creating innovative solutions while also integrating logic and research. In order to embrace Design Thinking and innovation, we need to ensure that we have the right mindsets, collaborative teams, and conducive environments. When we align our mindsets, skills and environments, we are able to create innovations that allow us to survive the disruptions we might face in the near future. Keep in mind a deep desire to create a better situation for the world around us, and start creating a better world for yourself and the world.